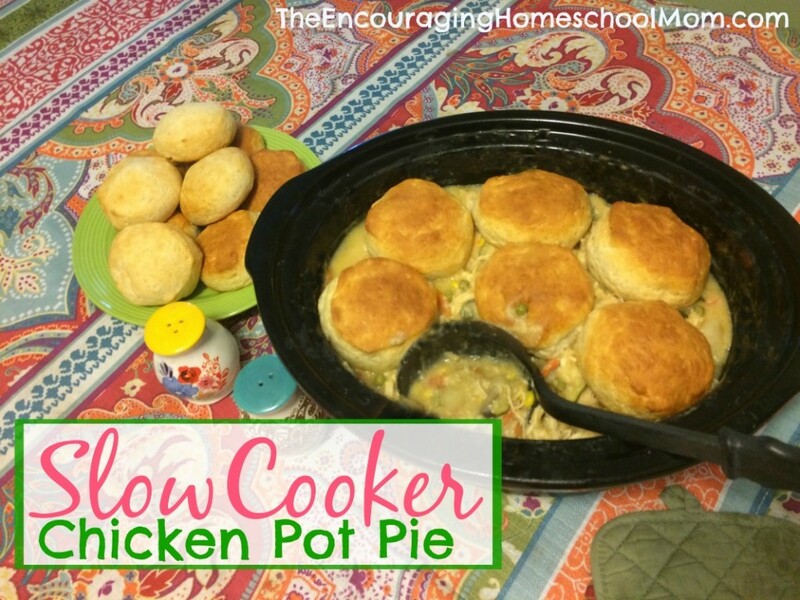 I mentioned in my large family weekly meal plan a few weeks back that we were having Slow Cooker Chicken Pot Pie. I received many requests for a cooking vlog, so today I’m sharing that recipe with you! You can watch the full Slow Cooker Chicken Pot Pie Cooking Vlog here. As I mention in the video, if all you have on-hand is condensed cream of chicken soup, you can skip this step. However if you have about 5-minutes extra (and believe me moms, I totally understand if some days you literally *do not have 5 extra minutes* — total grace! 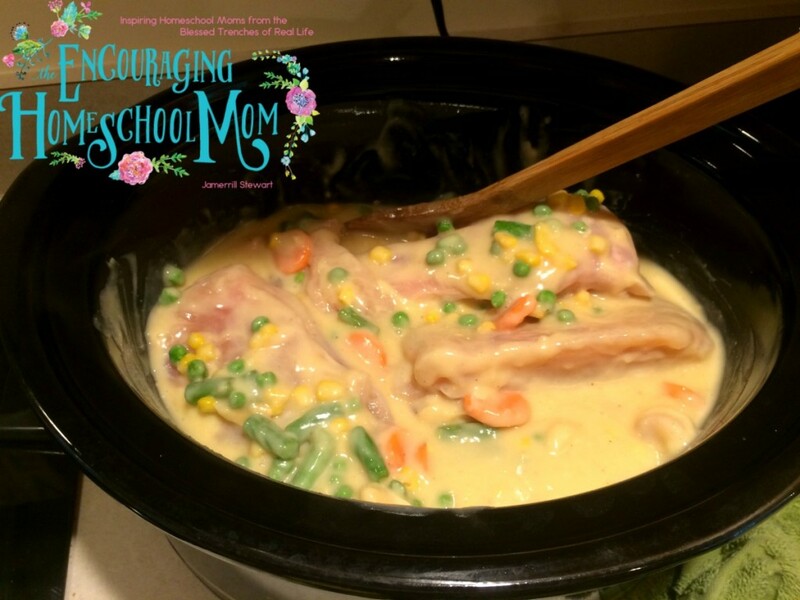 ), you can make healthy, homemade cream of chicken soup for your chicken pot pie in the slow cooker, or any recipe that calls for cream of chicken. 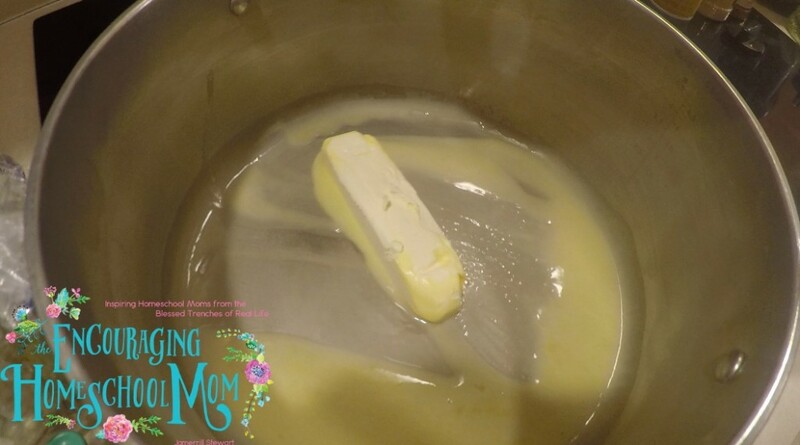 Melt one stick of butter over medium heat in sauce pan, stirring constantly. 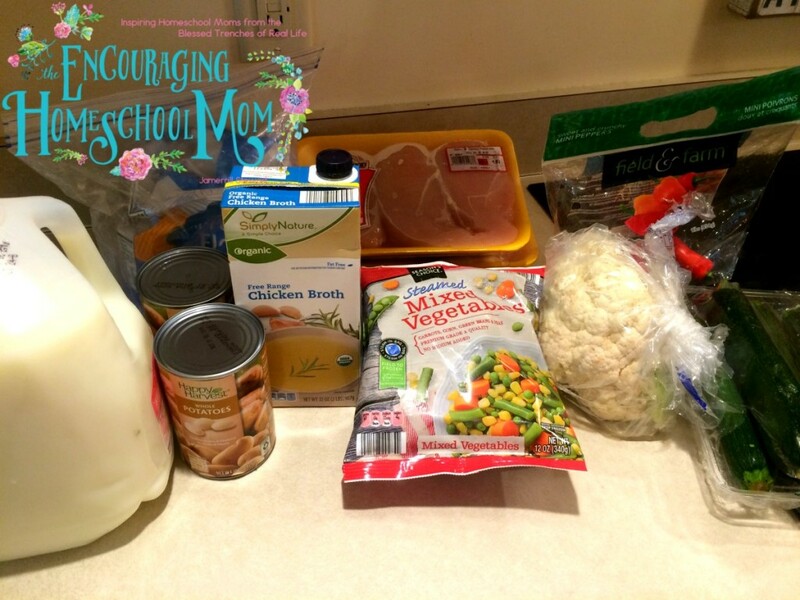 At the end of the 3-5 minutes you’ll have a yummy Cream of Chicken soup that’s perfect for Chicken Pot Pie! The next steps for making Slow Cooker Chicken Pot Pie is so, so, easy peasy. 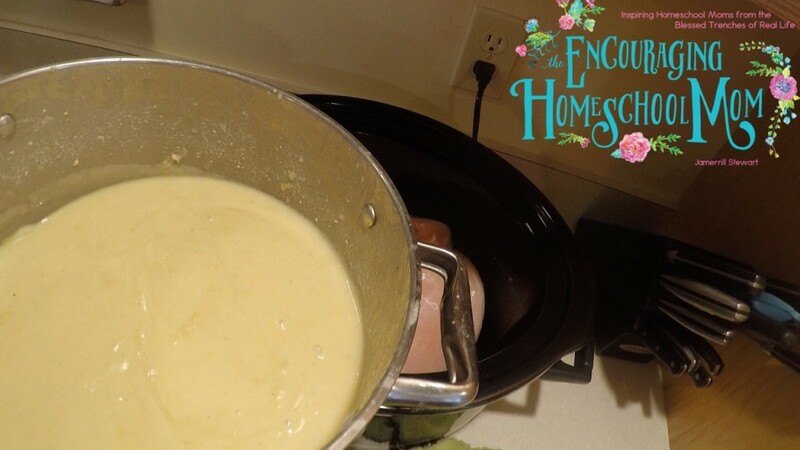 You now have your homemade cream of chicken soup poured over the 4 lbs of boneless/skinless chicken breast (or chicken thighs, or whatever chicken pieces you’re cooking with) in the slow cooker. Add in 2, 12 oz bags of mixed frozen vegetables. Now is also the time to add in cans of chopped potatoes if desired. Add in paprika and other spices to taste. Then I put the lid on the slow cooker for 3 hours on high. 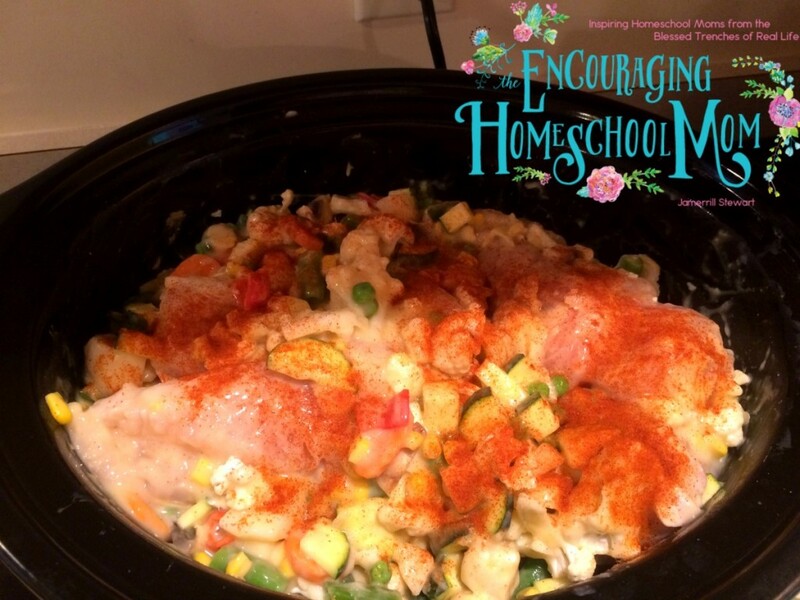 Of course slow cooker times may vary and your recipe may need a little longer or less time. After 3 hours I scooped my chicken breast out and shredded them with a fork, then added them back to the mixture and gave everything a good stir. Remember that extra 5 minutes we talked about earlier? Well if you had about another 10-15 minutes or so you could make fluffy homemade biscuits to top off your Slow Cooker Chicken Pot Pie. However on the day I made this recipe I didn’t have those extra minutes. Instead, my five year old and I popped open two cans of premade biscuits to top off our pot pie. 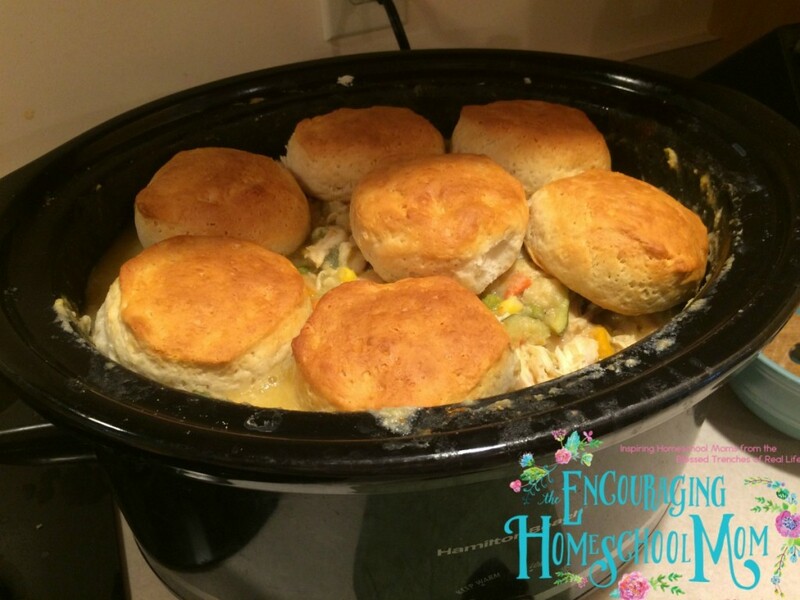 The only trick with the biscuits is to make sure you wait until right before serving to put your biscuits on top of the slow cooker chicken pot pie. Click here to watch the full Slow Cooker Chicken Pot Pie Cooking Vlog! Liam brings in a frog to show me, right in the middle of cooking and filming. 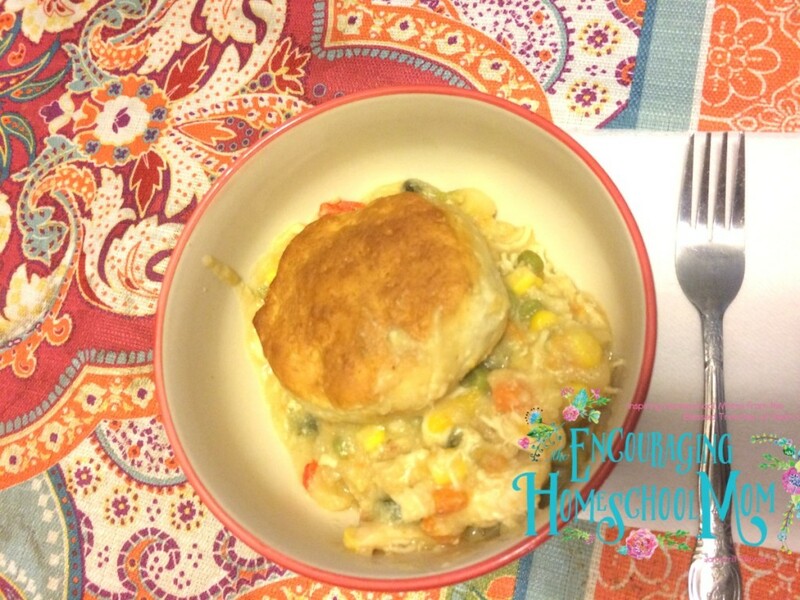 No frogs were harmed in the making on this Slow Cooker Chicken Pot Pie, ha! I’m totally drooling over here! That looks very delicious. I’m going to tweak it for THM & make it on Sunday for after church. Thank you so much for sharing it with us. Oh, I made the corn bread in the bread machine. It was a hit! My children loved it! I’ve actually made it twice in a week. I seriously just did a little happy dance. 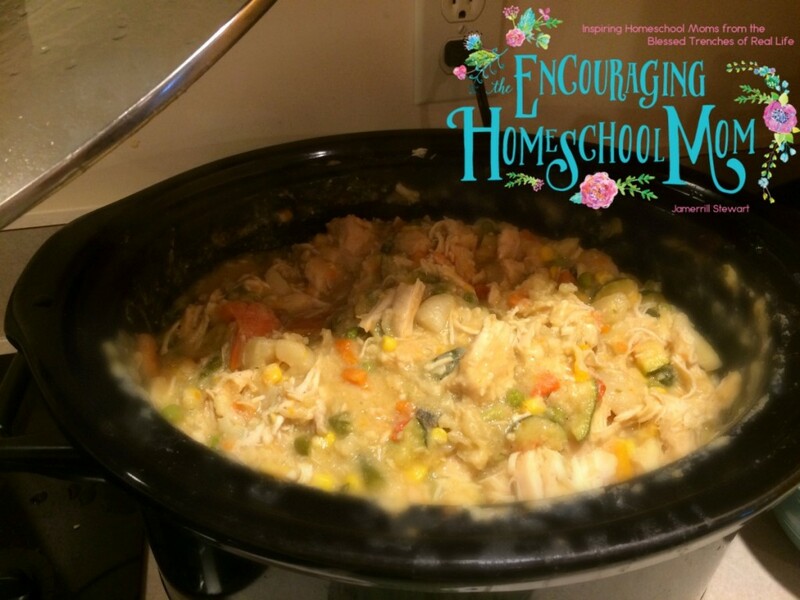 I am so happy you shared the video, instructions and the recipe for homemade cream of chicken soup. I think I can do this! Hi, I just found your YouTube channel a few days ago and I’m so glad I did! i can’t wait to watch them all!! 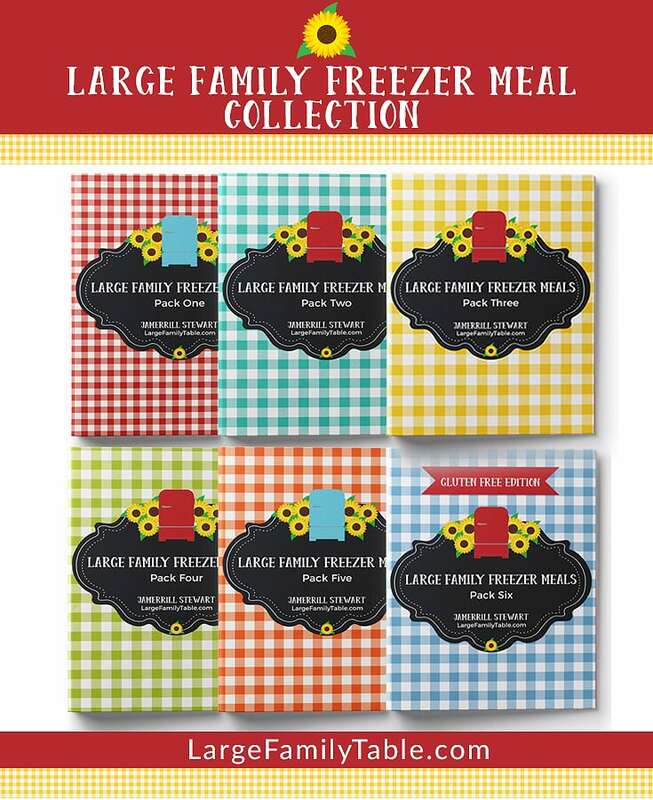 Especially the cooking ones and the freezer cooking ones. I can’t wait to try this recipe! !